Slipped by at first, but we found this over at Cartoon Brew: “Conrad Vernon is reuniting with Megan Ellison’s Annapurna, producer of last year’s hit Sausage Party, for another adult-oriented animation project, Amberville. The project is an adaptation of Tim Davys’ ‘Mollisan Town’ novel series set in a gritty world of stuffed animals. Amberville is being developed as a cgi series for Amazon Studios by Vernon and Chris McCoy, who wrote and directed last year’s Good Kids. McCoy wrote the pilot and Vernon will direct it. If the project makes it to series, it would be available on Amazon Prime Video. Amberville’s story revolves around a reformed Teddy Bear who is pulled back in to the criminal underworld when his former boss enlists him for an impossible new job.” Conrad Vernon, of course, is well-known as co-director of Shrek 2, Madagascar 3, and Monsters vs. Aliens. Thanks to Furry. Today, we got our first look at the newly-released trailer for Ferdinand, an upcoming animated movie from Blue Sky. And thanks to an article over at Cartoon Brew, we have a whole lot more information about it too! According to the studio, “Ferdinand tells the story of a giant bull with a big heart. After being mistaken for a dangerous beast, he is captured and torn from his home. Determined to return to his family, he rallies a misfit team on the ultimate adventure. Set in Spain, Ferdinand proves you can’t judge a bull by its cover.” It’s directed by Carlos Saldanha, who of course gave us not only Ice Age: The Meltdown but also Rio. Wrestling superstar John Cena (fresh off his turn as a voice actor in the Surf’s Up sequel) stars as the voice of Ferdinand the bull, but the Cartoon Brew article also features a huge spread of character designs and voice actors from the film. Look for it this winter. 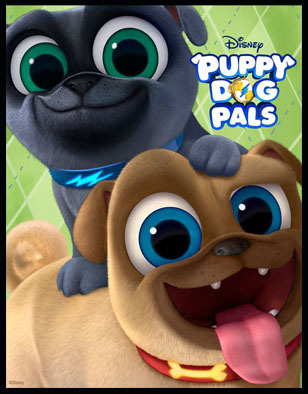 According to Animation Scoop, Disney Junior has a new animated series for kids called Puppy Dog Pals premiering April 14th. “The show follows two fun-loving pug brothers, Bingo and Rolly, whose thrill-seeking appetites take them on exhilarating adventures throughout their neighborhood and around the globe. Comedian Harland Williams… serves as consulting producer and writer and voices the role of Bob, the pups’ devoted owner.” There are some other well-known names among the voice cast as well. We got this direct from Anime News Network. 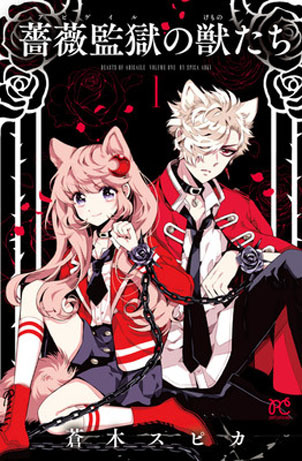 Seven Seas Entertainment have licensed Spica Aoki’s fantasy manga series Beasts of Abigaile for distribution in North America. Here’s what the publishers say: “ Beasts of Abigaile follows a young woman’s fantastical adventures in the mythical country of Ruberia—and all the trials, tribulations, and attractive half-beast people that come with it! In this exciting new series loosely inspired by the classic fable of Little Red Riding Hood, readers will embark on a beautifully-illustrated journey of magical adventure and romance. Tsukishiro Nina has just arrived in the beautiful country of Ruberia, and its charming denizens and lush scenery are like a fairy tale come true. That is until she’s beset by a mysterious young man with a steely gaze and furry wolf ears—who promptly bites her! Nina finds herself turning into one of these beasts of legend, and whisked away to the prison of Abigaile where all their kind are sent. Nina must keep her wits about her if she’s to learn the secrets of this magical world where everyone either makes her blood boil or her young heart race!” Look for it to be released in black & white this June. 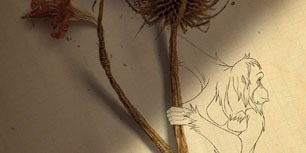 Cartoon Brew has a first look at Tomm Moore’s latest animated feature called Wolfwalkers. Mr. Moore, you may recall, is the Irish animation director responsible for The Book of Kells and Song of the Sea, both of which won praises from furry fans and animation lovers the world over. This new feature sounds even more anthropomorphic: “Wolfwalkers tells the story of 11-year-old Robyn Goodfellow, a young apprentice hunter who comes to Ireland with her father to wipe out the last pack of wolves. Her life changes though after she saves a native girl, Mebh, which leads to her discovery of the Wolfwalkers and transforms her into the very thing her father is tasked to destroy.” The article includes a teaser trailer the creators just recently released. John Layman made a name for himself with the surreal comic book series Chew. 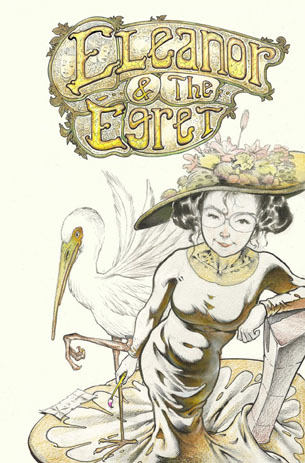 Now he’s at Aftershock Comics with a new title called Eleanor & The Egret. Here’s what Comic Alliance said about it: “With the wrap up of Chew this year, John Layman has proved himself one of the go-to creators when it comes to crime comedy comics, and Eleanor and the Egret looks to be at least as surreal as his previous series. Sam Kieth, the legendary creator behind The Maxx, feels like an exciting choice to illustrate this Catch Me If You Can-style caper involving an art thief and a heron.” A heron who eats fine works of art, in fact. This is from the publishers: “A slightly surreal tale of an art thief and her sidekick, a talking egret who gets just a bit bigger after each successful caper, as they embark on a escalating series of daring thefts of world-famous paintings, and dodge pursuers in an increasingly weirdly dangerous game of cat & mouse.” Look for it this April. 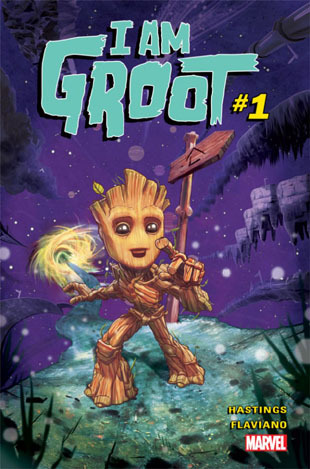 Not to be out-done, this May Marvel will also bring us I Am Groot, the first solo comic featuring everyone’s favorite simple-talking anthropomorphic tree. It’s written by Christopher Hastings (Gwenpool, The Unbelievable) and illustrated by Flaviano. “When the Guardians of the Galaxy get caught in a wormhole, a smaller-than-normal Groot is separated billions of light-years away from the team. Falling to a planet below, Groot discovers he is on an entirely alien and unknown world full of strange creatures and societies. Seriously underdeveloped and with nobody who can understand him, Groot will need to make the journey to the center of this world and find the way back to his family!” Comicbook.com has an interview with Mr. Hastings talking all about it. Rocket and HIS Old Friends! In what is perhaps a strange move (given his currently ever-growing popularity!) 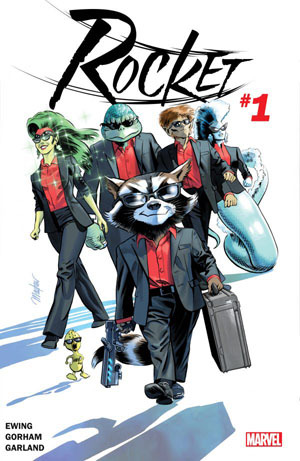 Marvel Comics have canceled their most recent Rocket Raccoon comic book series — only to replace it with a new one called Rocket, according to Bleeding Cool. “He thought his paws were clean, that they were on the up and up. But just when he thought he was out, they grabbed him by the fuzzy tail and pulled him back in. One day, and old flame (who happens to be an Otter) swims back into your life and just like that you’re back in the game…the heist game. From the dingy alleys of Knowhere to the far corners of deep space, they’ll speak in whispers that one of the best there ever was is back. If you need a safe cracked. If you need a vault busted. If you’ve got a big score that needs taking…you call Rocket. Just don’t call him a raccoon. It won’t end well for you.” Good Grief — the return of Lylla?? Look for it this May, written by by Al Ewing (The Ultimates, U.S.Avengers) and illustrated by Adam Gorham (The Violent).